6 A/C ATTRACTIVE SUITES IN PARADISE. LOOK FOR SPECIAL OFFERS!! 2 sizes of pleasant air-conditioned Suites, with double or single beds, wetroom, TV, Fridge & Wi-Fi, in an exclusive block of only six with private pool. Set in pretty private gardens with interesting rustic views. Being a small establishment we can cater to most individual needs, so if you require anything please ask. Our Chef cooks excellent food from our Extensive Menu at reasonable prices. Goa airport transfers, taxes & breakfast of your choice are included in the price. We will strive to ensure that you have everything you need to make your holiday truly memorable. Your daily breakfast, with freshly squeezed juice, is served at any time before 11am, in or outside your suite, or in the garden. We will be happy to advise regarding any excursions, having a broad knowledge of Goa & the surrounding states. A bird watcher's paradise - Over 30 species of birds can be spotted during the delightful 10 minute walk to the beach and shops. You may encounter monkeys, buffalo, cows, all placidly going about their business on the surrounding quiet roads. Coast/Beach: The beach, local shops and more than half a dozen good restaurants are all within 10 minutes flat walking distance. We can call a taxi for about a pound if you prefer .Bogmallo is situated in a small cove with a pretty beach about 1km long backed mainly by coconut palms, this makes it one of the safer beaches for swimming with a life guard normally on duty. We built the guesthouse and opened in 2006 and have had the same staff since opening , have two very friendly dogs and Raj our excellent cook and his wife have two children of 7 and 4 years old. Very friendly English run . Please see recommendations on TRIP ADVISOR under Tanisha Guesthouse. Bathroom with fitted modern shower, wash basin, European WC. 24 solar heated hot water. Living room with double sofabed, chairs, centre and side tables, Satellite TV and wi/fi internet connection. Leads on to a large balcony at the front of the building with lovely open views. A fridge, tea and coffee facilities, are supplied in each apartment. Notes on accommodation: The suites are cleaned daily, bed linen and towels are changed every third day or as necessary. Iron and ironing board are available on request. Our friendly staff will do their utmost to fulfill any other special requirements. Chargeable Laundry Service is available on request. Outside: The walled garden is mainly lawn, surrounded by shrubs, trees and flower beds. Ample tables and seating for our guests around the private pool. Lovely 10 day visit here for myself and partner. We wanted a quiet holiday and it was really perfect. 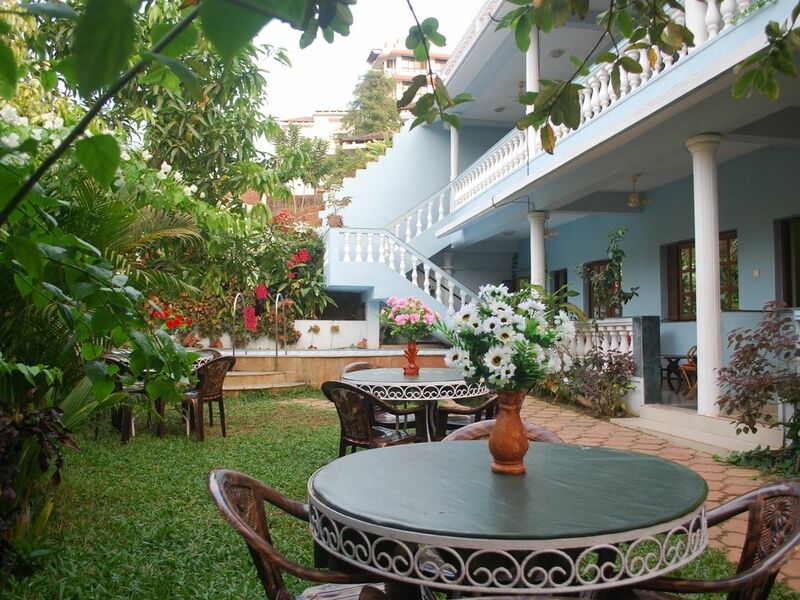 So many great features including the pool, privacy, the shady balcony, lush tropical garden and Raj's excellent cooking! Being close to the airport with pick-up and drop off was a bonus too! Our unit was simply furnished with a kitchen counter and sink and small bar fridge. It was clean and tidy when we arrived and was cleaned regularly during our stay. The small cove-like beach is filled with locals - including a few fishermen that we watched bring in their nets in the evening. The little beachfront is full of just enough shops and restaurants that you get the vibe without losing the quaint feel of the place. Full Moon Cafe was particularly good - I think we had dinner there a few times during our visit. When we felt bored, we took day trips to nearby beaches (Colva is particularly good) for a change of pace. That worked well, but mainly, we just enjoyed the quiet solitude and the walk to the beach. One mention - the house dogs are delightful. They came with us on our morning walk and played in the water with us - so well behaved. We are situated behind the scenes of Bogmalo, where peace and serenity go hand in hand. Our rooms are cozy and comfortable and come with a little slice of Goa, that’ll stay with you even when you leave. So relax and take a break, whether it’s a dip in the Pool, reading in the Garden or having a bite from our kitchen. If you’re not looking to relax take a pleasant and scenic 10 min walk through the village (Taxi available for roughly a Pound) reaching the Hub of Bogmalo. The Beach! A small cove 1 km long backed mainly by coconut palms; this makes it one of the safer beaches for swimming with a life guard normally on duty through the day. Here you can partake in various beach activities, relish in fresh local cuisine and enjoyable nightlife. We look forward to having you, see you soon! Dabolim Airport is about 15 minutes away by Taxi and self drive motor-cycles can be hired in the Village. A local bus service operates from Bogmalo to Vasco every 30 minutes, costing 10 ruppes each way! Vasco has a Railway Station and bus/coach station that connects Goa to other states in India. Bogmallo is about 8km from Vasco da Gama the nearest city which has a railway station, as has Margao. It is about 30km to both Panjim the capital of Goa and Margao. Old Goa, Bondla Wildlife Sanctuary, Historic Temples and Dhudsagar falls (The highest waterfall in India) are all within 1 to 2 hour's drive. Prices are for a Suite, for 2 people per week in UK pounds. Two Large Suites 3 & 6 plus 20%. Please note the above rates are inclusive of all Govt of India taxes. . Add an extra £50.00 for additional person(s) per week. All suites sleep up to 4 people. Discounts for long term bookings. Booking notes: A Booking Procedure is carried out via the Internet. Email inquiries are followed up informing prospective clients of availability & Total Cost of the Holiday. Holiday to be paid in full, as is also the case for very late bookings. We accept Bank Transfers to our English Account.